“Safe space” could include amenities like hand-washing stations and bicycle storage, but some homeless fear they will be confined to the area. (Steve Griffin | The Salt Lake Tribune) Workers cement fence posts into position on Rio Grande Street in Salt Lake City Monday September 11, 2017. (Steve Griffin | The Salt Lake Tribune) Workers cement fence posts into position on Rio Grande Street in Salt Lake City Monday September 11, 2017. 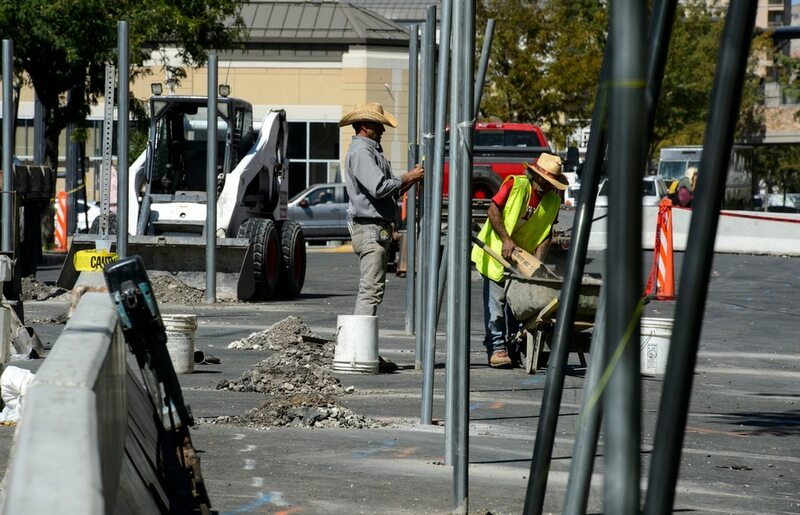 (Steve Griffin | The Salt Lake Tribune) Workers cement fence posts into position on Rio Grande Street in Salt Lake City Monday September 11, 2017. (Steve Griffin | The Salt Lake Tribune) Workers cement fence posts into position on Rio Grande Street in Salt Lake City Monday September 11, 2017. Officials say it’s meant to keep drug dealers out. Some homeless people worry it’s being built to pen them in. Either way, part of Rio Grande Street will soon be off-limits to anyone without a homeless services ID card. On Monday, the state began installing an 8-foot-tall chain-link fence that officials say will be covered to reduce visibility and prevent dealers from passing in drugs. But even as fence posts were planted in the pavement, the state was hashing out its plan for the space between The Road Home shelter and, across the street to the east, the day center and dining hall owned by Catholic Community Services. The ”courtyard”-style enclosure has been portrayed as a vital next step in the $67 million Operation Rio Grande, a two-year effort to reduce lawlessness in the area before the planned July 2019 closure of the 210 S. Rio Grande St. shelter. Without it, Utah House Speaker Greg Hughes has stressed, law enforcement will lose the ground they gained when they descended en masse in mid-August, and officers could face constitutional objections if they enforce city ordinances against camping and loitering. Offenders could argue they have no other safe place to go. Still, Hughes and others have said that their “safe space” won‘t become the homeless campground called for earlier this year by former Salt Lake County Sheriff Jim Winder. Among the possibilities for the streetscape: hand-washing stations, portable restrooms, bicycle storage and a tented structure that could be walled off and heated in the winter. Even relatively immediate decisions like the fence covering — it might be construction mesh or privacy slats or artificial turf — have yet to be made, but Hardy said the project will likely be completed within a $200,000 budget. “They‘re going to close [the shelter] in two years, anyway,” she said. Laurie, 57, teared up while listening to Jonnette launch into a broader critique of Operation Rio Grande. She’s ”scared,” she said, and worries that soon she won’t be allowed to leave the fenced-in area. “A lot of people feel like they‘re having a prison built around them,” she said, as Jonnette nodded in agreement. 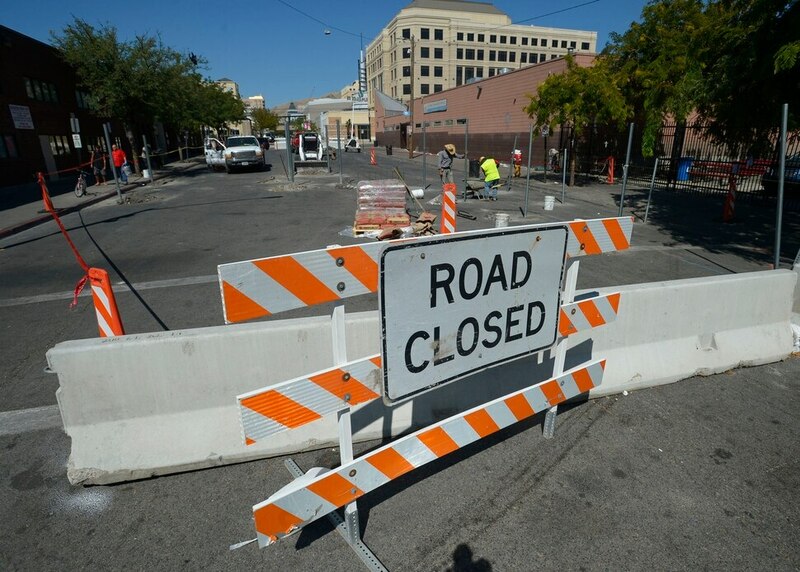 The City Council has yet to approve the lease signed late last week by Salt Lake City Mayor Jackie Biskupski that gives the state control of the property — a public hearing is planned Sept. 19 — but the state got to work anyway. 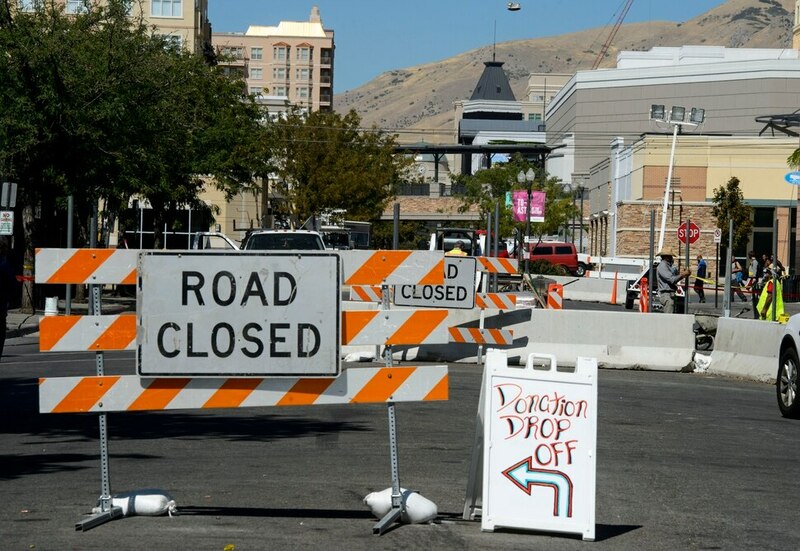 After talking to The Salt Lake Tribune, Jonnette and Laurie were soon ushered off the east sidewalk because of its proximity to construction. The metal posts erected Monday hinted at the eventual fence line. In the middle of the street, four posts surrounded what will become a screening point, where a security guard will check IDs. The northern boundary runs directly east-west, closing off Rio Grande Street to access from 200 South. The southern boundary is more geometrically complex. It begins north of The Road Home’s women’s entrance — leaving that door and a nearby parking lot open to public access — and extends east to the screening point. From there, it juts south down Rio Grande to the end of Catholic Community Services’ footprint. The resulting space, from above, resembles a cleaver. A gate at both ends of the street’s west side will swing open to allow passage of emergency vehicles, and Hardy said a 6-foot interior fence will create a buffer space of about 10 feet to dissuade dealers from tossing drugs into the area. Hughes admitted while checking the space out for himself Monday that it was smaller than the space he had once hoped for. Across the street at the ”war room” storefront he used to spearhead Operation Rio Grande, Hughes last month drew a line all the way around The Road Home shelter down to 500 West when asked what the safe space might look like. And as conceived it’s at least large enough, Hughes said, that drug dealers won’t be able to advertise next to the door to homeless services. “I cannot stand when I‘m sent the pictures of them standing like centurions at the gate,” he said. The ACLU of Utah and Crossroads Urban Center have expressed concern about the proposed fence and an ID card system that still has yet to be unveiled. “I think this is just another example of our elected leaders just desperately searching for any answer, even if it‘s something that it isn’t clear is going to work,” said Newlin, who formerly managed The Tribune’s website. But 86 percent of respondents to a city survey said that closing the stretch of Rio Grande ”will increase the safety of those seeking homeless services,” and a community input session held at the nearby Gateway mall last week featured a relatively subdued crowd — if not entirely pro-closure. The City Council was also supportive of a temporary closure to vehicles and raised no objection when Biskupski was asked to sign a lease agreement that will expire Nov. 30 unless they agree to extend it until the 2019 closure of The Road Home shelter. Only City Councilman Andrew Johnston responded to a request for comment about Monday’s construction, saying in a text message that he will only support the closure if the state shows how it plans to measure success.